Sweet Potato Equipment & Parts — Farmers Harvest Inc.
Click here to see the 2 row vine snapper in action! Click here to see the 4 row vine snapper in action! Click here to see the results of vine snapping! Click here to watch the Omega Table remove dirt clods during sweet potato harvest! Click here to watch the Omega Table remove vines during sweet potato harvest! Click here to watch the Guardian Box Filler load white potato boxes with ease! Click here to watch the Guardian Box Filler load sweet potato boxes with ease! Understanding the mechanical sweet potato harvest has been an ongoing project for seven years, of which we are very proud. In its current state, the mechanical sweet potato harvest has become completed. Originally working with Standen Engineering, Burch Farms, Thornhill Farms and Dawson Farms, a mechanical harvester was designed to dig sweet potatoes. The TSP1900 has proved its feat time and time again, digging both fresh market and process sweet potatoes. The variable speed hydraulic drive system allows for gentle handling of sweet potatoes while digging them. The variable scroll sizer and Omega table allow the TSP1900 to be successful in all environments. While designing the sweet potato harvester, FARMERS HARVEST INC. worked directly with General Metal Fabrications to redesign the vine snapper, a machine which had some issues and fell short of its potential. During the 2012 Field Day at Burch Farms in North Carolina, the Bau-Man Vine Snapper and Standen TSP1900 proved to be a dynamic duo. Yet, there was still a missing component. Skinning was still noticed during the loading process, when sweet potatoes were transferred from the boom to the pallet boxes. Many designs were proposed, but the exact solution wasn't rendered until late 2014, when FARMERS HARVEST INC. and Larrington Trailers began working together. Larrington's Guardian Box Filler trailer appeared to be the missing component. 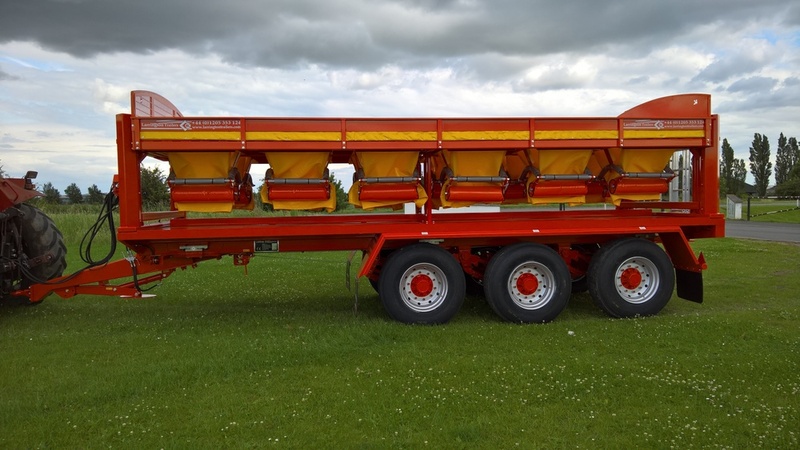 A Guardian Box Filler trailer made its way to the States during the summer of 2015, where it was first tested on white potatoes at Sterman-Masser. After great success in Pennsylvania at Masser's, Larrington went back to the drawing board to make the Guardian accommodate sweet potatoes, while removing some unnecessary English components. Click here to watch the Bau-Man Vine Snapper, Standen TSP1900 and Larrington Guardian Box Filler trailer working together to harvest fresh market sweet potatoes. "The Proof is in the Box"
Sweet potatoes that were vine snapped on display at the LSU Field Day in 2014. The remainder of the mother root after using the Bau-Man Vine Snapper to vine snapper sweet potatoes. Sweet potatoes dug at Burch Farms in 2012 with the Standen TSP1900 sweet potato harvester. Sweet potatoes dug at Alexander Farms in Vardaman, MS with the Standen TSP1900. Bragg Farms' fresh market sweet potatoes fresh out of the Standen TSP1900 in 2015. Fresh market sweet potatoes being dug by a Standen TSP1900 and loaded into a Guardian Box Filler trailer. Sweet potato rows four days after being vine snapped at Alexander Farms in 2014. Sweet potatoes that have been vine snapped using the Bau-Man Vine Snapper. Townsend Farms' (Live Oak, FL) sweet potatoes dug in 2013 using the Standen TSP1900. Sweet potatoes dug at Edmondson Farms in Vardaman, MS with the Standen TSP1900. Fresh market sweet potatoes dug at Sandy Ridge Farms in Vardaman, MS.
Unloading a Guardian Box Filler trailer at Bragg Farms in October 2016. Click here to watch the Bau-Man Vine Snapper, Standen TSP1900 and Larrington Guardian Box Filler trailer working together to harvest fresh market sweet potatoes.